you won't see as many tiki's on Maui as you will find on Oahu or the Big Island of Hawaii. they might otherwise miss. Good Luck and Happy Tiki Hunting! 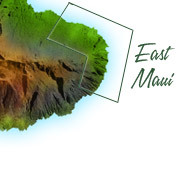 Your Maui Tiki Tour is divided up into the 5 regions of Maui. Choose the area you'd like to explore.